Xbox live is set to increase by May 8th so may be best to stock up by then. £7.79 for 3 Months, not 100% sure if you can stack them or not. I know the increase is a lot in one go, but the price has been the same for a very long time so it was inevitable it would increase at some point. Remember that it used to cost £40 with no free games every month. big old rise, which bearing in mind how it runs on the premise of "what the market will take" ../ how far can we stick our fists up the customers @-r-s-e &amp; get away with it, ...no wonder everyone is spending cash on other countries cheaper sites... Get a grip microsoft! That's only 83p cheaper and that's if they let you buy 4 of them. Couldn't agree more. My Player was one of my favorite game mode ever in any game genre until 2K12. Then they introduced VC in 2K13 and it's been going downhill ever since. This is a hot deal on price, but.... I'm well into my NBA and used to run an NBA 2K website, but I have to say, this game has been terrible for years. NBA2K14 was maybe the last good one. It's been pay to play ever since. It's very hard to get anywhere in this game without buying Virtual Coins. It's got worse as time has gone on; at first you could only spent VC in My Team (similar to FIFA UT), then it was sort of optional (in that you could grind it fairly easily if you played it often) for My Career Mode, now it's pretty much a requirement for the entire game, it's even the MYGM management mode. The VC rewards you get for playing are ridiculously low. If you want to play online to any decent standard you'll need to dip your hand into your pocket, frequently. Even if you want to play offline and experience a decent portion of the game, yes, you guessed it, you'll need to spend, spend, spend. 2K are far worse than EA. They've got far too greedy. The fact this game costs sixty-odd quid at release (and upwards, if you want anything more than the basic game), and then forces you to constantly spend money is a complete joke. Without doubt it's the best NBA game on any platform when it comes to gameplay, but I'd still honestly recommend avoiding it. If you want to experience any mode except the "friendly" style 1v1 games, you're REQUIRED to spend money. 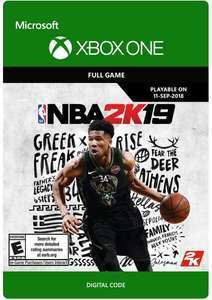 Nba live 19 has just been put in the vault on Ea access! Nba 2k19 plays so much better . 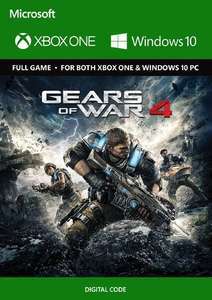 Is this the one with Female 'Gears' when the whole storyline for Gears of War was that selected male humans had to hormonally enhanced so that they grew to a huge size comparable to take on the enemy? Nah... another Lore ruined by political correctness. This was the only one of the series I didn't have so fantastic deal thanks! Anyone else having this hard lock their PC? I've not had that on PC for a long long while. Microsoft should have included the blue screen for nostalgia's sake. you can get it yourself from FB. Any one have 5% FB code PLEASE? On the previous deal for this particular version from CDKeys. I had a user comment that they had purchased it, and indeed it did come with the pre-order wallpapers and two guns. As well as the deluxe DLC. That's the best source of confirmation I have. And as it's advertised on their site, I would've thought they would have removed it by now if people had purchased it and not received all of what's described there. Tried that link a million times this morning on PC when buying £50 steam credit, nothing but a broken image icon. Gave up and paid the £46.99 would have been nice to save another £1.40 but wasn't getting anywhere with it. UPDATE: Just tried it on my second PC and it works. That's annoying. After a night shift I clearly wasn't thinking properly and it never even crossed my mind to try another machine. Oh well at least I'll know for next time, thanks for the help. Once you have the code (if that's what you're asking). Copy it into the 'Discount Code' when you are looking at your basket. Crime is crime. Stealing is stealing. Its very simple. Dont pretend being saint OK. If someone can get freebies dont be jealous. Only fools pays full price. Even most of politics have offshore accounts and dogging pay tax here, so why I cant take some small advantage of doing that with games? No, but I think them ruining games and being the only way to make real money because of piracy is. I'm just trying to understand, do you think loot boxes are solely because of piracy? What does "facebook code" mean in this context? Loved the original and was sceptical they wouldn't be able to achieve the same feeling of helplessness you got in the original but they nailed it. Absolutely love the game, the blend of old and new, the amount of backtracking felt just right, that feeling you get when you unlock a door from the other side and think "ooohhhh so this is where this leads". The map removes so much of the tedium of the old games where it was very easy to get stumped. Personally don't mind it doesn't take that long to finish, took me 8 hours with Leon first time, 5 hours for Claire B, I blasted a run of Claire A the other night in 2 hours, it's a trim experience which I enjoy. Mr X is terrifying on the remake, he chased me for a bit and I ran straight into a Licker who promptly ate my face after I fumbled around looking for my flash grenade only to realize I'd left it in storage. Curse you hip pouches. The game is amazing guys, currently sittting at "Overwhelmingly Positive" on Steam, Runs like butter, no bugs. It's great! Am slightly dissapointed by the B scenario's though. 4 hours suggest you rushed and played on easy mode? I can imagine that would be boring yes. All codes gone now. Expire please. I ordered from JustEat this time, but the standard price at FoodHub was very similar, just a pound extra and will consider ordering from there in the future (about 10% cheaper and no service charge). The restaurant pays no commission as well. It's been edited with the new price. That was originally posted at £39.99. Where can I get the full first season along with the 2nd season all in one? How does getting the original levels work ? I have hitman 2016 on my steam account but not downloaded. Coupon code hasn’t worked for me in ages. All I get is a broken image link. Tried everything. This is a fantastic game. Bargin! Thanks! That looks like a really useful website too. Note the deal for 3month live + £10 credit, it pops up every so often for £15. 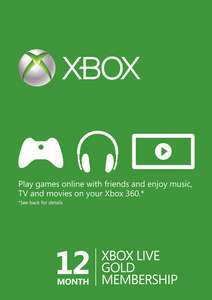 £75 would get you 15months Xbox live + £50 credit. Great if you are going to buy something anyway but otherwise personally would hold out for it. I used CD Keys a few weeks ago. Once redeemed onto your Microsoft account, there was no indication that it had any expiry date. I stand corrected. Thanks for the info, I wasn't aware of that. Confused as to why this has been voted cold with no relevant comments. Just curious, what's wrong with Free £10 credit. Apparently Labour HQ are considering releasing their own version of this called ‘Tory Berks’. Reportedly, it will smell like sour grapes. They might as well just sell up with that name. Did something like this a while back never received any samples, they just wanted my details. 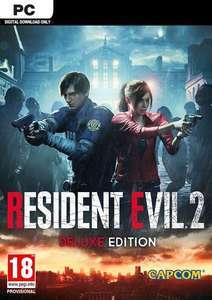 Controversial game I know and unfortunately the 04/12 patch wasn't the revelation I lot of people were hoping for but I've still had quite a lot of fun with this game so far. That's some quality stuff mate! :D I'm disappointed the F76 turned out the way it did as I'm a massive fan of the franchise. I might still buy it at some point - that is when they fix the performance issues. Well just checked the price it has dropped a bit further currently £16.99 before the like code. Building a base gives you access to any crafting/work benches that you have unlocked &amp; can build, you can also place a stash (private storage) and bed there. You can learn new plans for things to build in your base by questing &amp; exploration. IMO, after that the bases are pretty much a vanity project unless you're going to PvP &amp; want to have the biggest turrets &amp; defences. You can also capture resources, farms &amp; scrap yards, which are much bigger plots &amp; you can use that as a base instead. My friends &amp; i tend to just use bases for Free travel around the map. I really enjoyed fallout 4 &amp; i like building &amp; creating stuff so i'm enjoying the game and i think that this a good price for it. Which format are you playing on ? AND A crazy question....I am not a big fan of building bases in games , is the building side of Fallout 76 essential to the game or can I happily play with no need to build a large camp ? Worked fine for me. Thanks OP. Create a dummy account just for deals like that. No need to be active on Facebook.